Published: Gollancz Masterworks, 2011. ISBN 0 575 09946 3 [paperback £7.99; pp.247]. First published in hardcover by Faber (1981). Also available in translation. 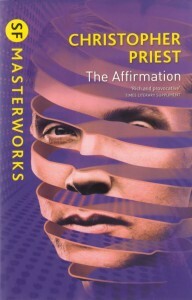 This is the book CP regards as his ‘key’ novel: all the novels before it lead towards The Affirmation, none of the ones that follow could have been written without it. It is deceptive in form, not only in the way the protagonist’s story is told, but also in the way it is presented. The opening pages wrongfooted many of the first reviewers, as many novels do, but thirty years later came an unexpected discovery. The convoluted story of The Affirmation at times seems to threaten the reader’s own hold on reality. Peter Sinclair, a young man enduring what he sees as a personal crisis, tries to make sense of his life by writing it down as a fictional story. In the story he depicts himself as the winner of a lottery, where the jackpot prize is a complex medical and neural operation that will ensure life ever after. As he writes, working ever deeper into his psyche, Sinclair finds that his two identities are starting to merge. This Masterworks edition has an Introduction by the critic Graham Sleight.